Most double oven ranges have a smaller oven on the top and a larger oven on the bottom. Some models have two ovens that are more equal in size. 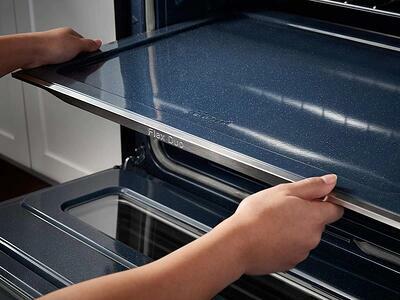 In most cases, the ovens take up the entire range case, so many double oven ranges do not have storage drawers. This is their one drawback, but it's not a big one for most consumers. If you cook a lot and have other storage in your kitchen, it can certainly be worth giving up the storage drawer. Think of how convenient it would be to be able to cook two dishes simultaneously for different lengths of time at different temperatures! This makes preparing a multi-course meal so much easier, and when it comes to weeknight dinners, the smaller upper oven is the perfect size for a smaller meal, and preheats quickly. 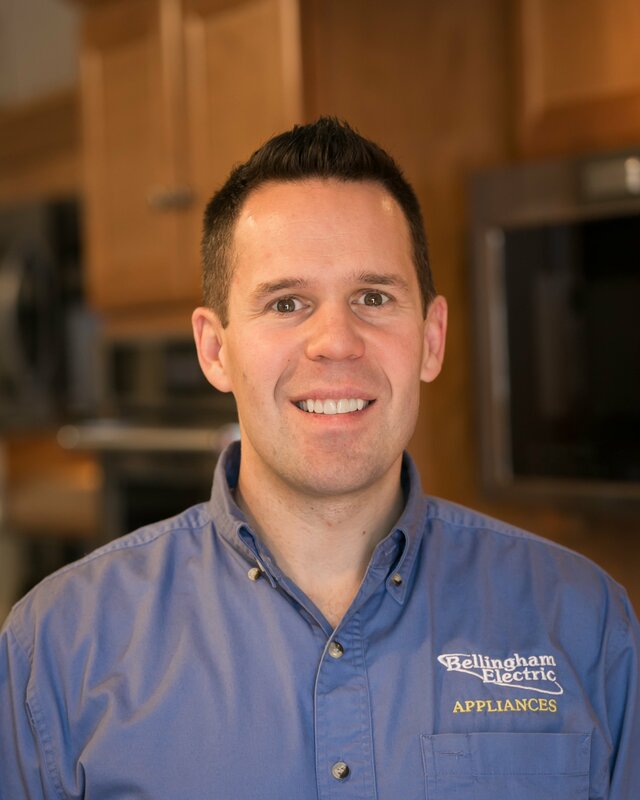 In general, when you're buying this type of range, you'll want to try to get a feel for the controls and the space within each oven while you're at the store. Many double oven ranges come with convection cooking options, usually in the lower oven but sometimes in both. There are so many different double oven ranges on the market that we can't cover them all in this review, but we chose two different models that illustrate some of the unique differences. Also of note, these two double oven ranges fit in a standard 30" opening like the one that you most likely already have in your kitchen. 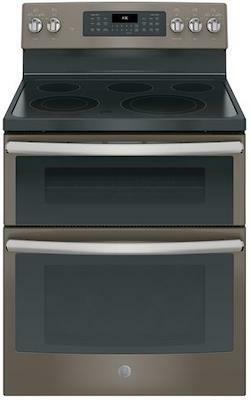 The GE JB860EJES is a 30" free standing double oven electric smoothtop range with two ovens totaling 6.6 cubic feet. It has a 2.2 cubic foot upper oven and a 4.4 cubic foot lower oven with convection. 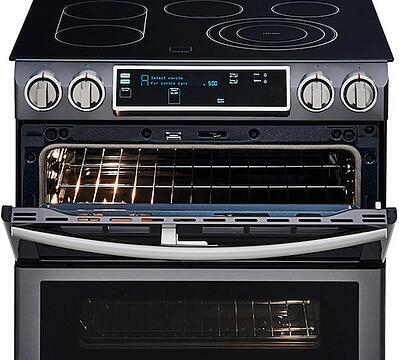 The lower oven comes with a six-pass bake element and the upper oven has an eight-pass bake element, and both come with six-pass broil elements as well. The self clean cycle will loosen baked-on crud, no scrubbing required. The stovetop features two adjustable burners and five burners in total to give you plenty of versatility. The oven controls keep it simple: on one side are all the upper oven settings, and the other side has all of the lower oven settings. It comes in several colors, including GE's exclusive slate, a stone-inspired matte finish. It's one of our top-selling double oven models! Click here to learn more about this range and read over 200 real customer reviews! You can find a similar top-selling model in gas, model JGB860SEJSS, for $1,799. 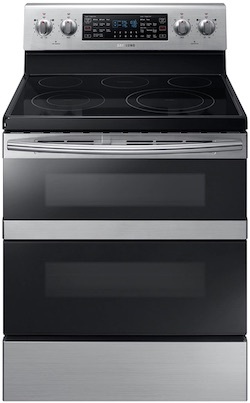 A unique model you might also want to look at is the Samsung Flex Duo double oven electric convection range model NE59M6850SS. This 30" free standing range has one large 5.9 cubic foot oven, but thanks to the Flex Duo divider, you can divide it into two ovens: a 2.6 cubic foot upper and a 3.2 cubic foot lower. Dual convection ensures that both sections receive even heating and faster cooking. Talk about flexibility! Pictured below: the Flex Duo divider. The Dual Door on this range is also flexible, allowing you to open just the top oven or the entire oven to conserve heat (pictured below on a slide in electric model). The line of Flex Duo ranges includes slide in models, gas and electric models, and even models with wifi connectivity. The only limitation on the Flex Duo system is that there are constraints on the temperature range when it is in "Twin Cooking mode," so that's one possible issue if you want to cook two dishes on high heat at the same time. The controls on this oven style are a little more complex than the ones featured on the GE model, so play with them in the store if you can to see if you like them! 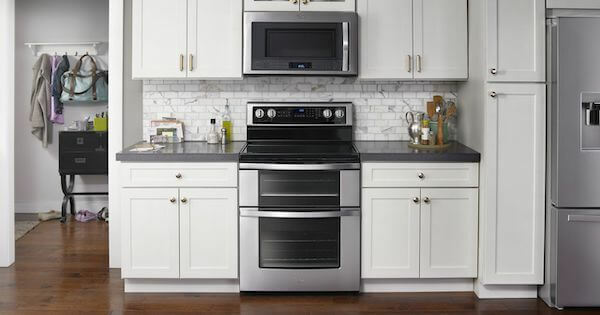 This model comes in stainless steel at $1,499 or fingerprint resistant black stainless steel at $1,599 (click the link to learn about black stainless steel appliances). A similar gas version, model NX58K7850SS, is available at $1,699. Double oven ranges are certainly not for everyone. You can create some amazing culinary masterpieces using a good old fashioned oven, and some people prefer not to bend over to access the lower oven. However, if you want the added flexibility of being able to cook two separate dishes at once, they can be a great option. Double oven ranges are always more expensive than their single oven counterparts, they can typically be several hundred dollars or more. A dual fuel double oven range (the best of both worlds) will usually run at least $2,500. Let us know what kind of range you end up purchasing. We’d love to hear from you!